Why do some stars twinkle? Why do some cycle through yellow, cyan and magenta so impressively? Thus we ponder this evening, my walking monk companion and I. We spin on the subject of stars and colour balance and photo printing for awhile, we then move on. There is no lack of subjects to talk about as we walk in the dark. 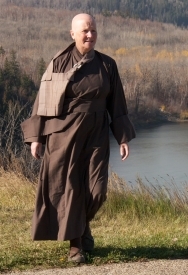 One sojourn with this monk and I have enough material for a blogging week. For some odd reason the thought of smoking a cigarette came to mind towards the end of our walk. I’ve not lit up for over 30 years and have no intention of starting again, however old thoughts surface, and pass. Not a problem. Walking up the lane after meditation this evening the stars were no longer visible, the sulky moon no where to be seen. The whole valley is filled with smoke, somewhere something is burning. This is unusual and no doubt we’ll hear about it. But what is really smokin’ (an American expression I believe) is the behind the scenes work on both this site and Jade Mountains. Heavens! if I hadn’t been so busy this past week(s) I’d have been occupying myself trying to understand the process of the two sites becoming one site. So, very soon this page will be looking rather different. I hope you will remain patient while all of this is happening. I cannot pretend to know what this development means in practice however it feels to me as dramatic as a house on fire. What will be left when the smoke clears? Many thanks to my friend in Texas, a fellow Buddhist blogger and all round generous chap, who is beavering away behind the scenes in his spare time. And thanks also to my walking companion who helps me unstintingly in so many ways. I haven’t smoked for ten years but the smell of someone’s first, just-lit, early morning cigarette caught my nose on the way into work this morning and my body reminded me that whatever my brain thinks, part of enjoyed specific smoking moments (there’s a longer post in there somewhere). For the moment, it’s always a reminder the the body remembers, the body never forgets. So glad you wrote that comment ‘dad’ (double dad now). I still ‘enjoy’ a brief whiff of cigarette smoke. You are right, there is a long blog in there and please let me know when you have written it and I’ll link. And thanks to Jack for leaving your comment about your grandpa. My ordination brother, we were ordained on the same day, who worked in the construction department when we were novices would exclaim now we’re smokin’! when a bit of real progress was made, like a stud wall being raised. I can hear and see him now. SMOKIN’!